Rays of Hope e.V. – Vision in action! In 2003, a handful of employees from a major German airline – regularly confronted with everyday hardships faced by many South Africans – decided to provide their support. Friends and acquaintances joined soon. In 2007, Rays of Hope e.V. was founded and has since registered as a charitable organization. Our goal was and is to assist South Africans in need by strengthening their self-esteem and showing them ways out of poverty for an independent and dignified life. We translate this vision not only by merely assuring people’s survival but also and mainly through education and training involving toddlers, students, young people as well as adults. Besides financial emergency support we stabilize the work of our partner organizations by implementing ecological infrastructure measures to dampen operational expenses over the long term. We also support our projects with expertise, either through desk-top advice or through the temporary on-site involvement of highly qualified volunteering specialists. This close collaboration with our partners ensures transparency and creates lasting trust. Our projects are based on the principle of helping people help themselves and are geared towards sustainability. 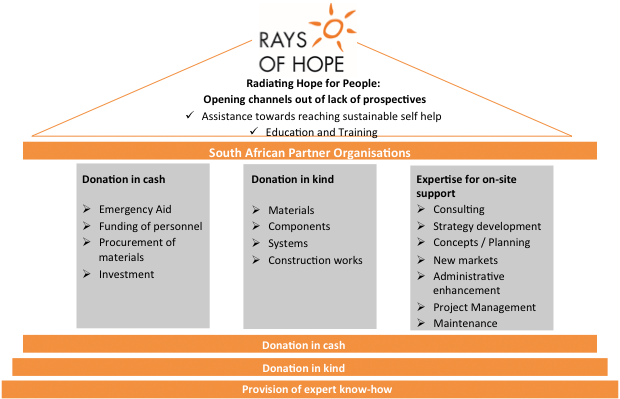 Because of many successfully completed activities, Rays of Hope is meanwhile recognized by private donors and companies as a trusted partner in the conception, implementation and operation of socio-ecological projects. We fund our activities through private donations in cash and kind as well as through CSR programs of companies whose logo we proudly publish on our homepage. Thank you for this help and trust in our work, because every Cent, every Euro helps to secure food and shelter for many needy people and enables children and youngsters to obtain a qualified schooling. All operational costs incurred for postage, fares and administrative duties are paid by our members out of pocket. Auditors ensure proper accounting so that our work and cash flow is fully transparent. In addition, we regularly inspect our projects and programs in the field and verify their progress. For any questions or suggestions please do not hesitate to contact us. 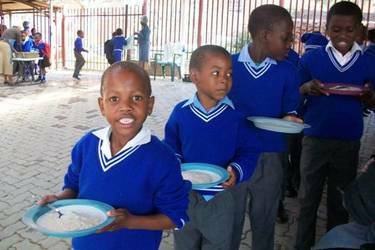 At the Riversands Primary School near the townships Diepsloot a feeding scheme was developed and supported, in which about 650 students were given a full meal three times a week – for many the only warm meal of the day. Countless times RoH members and their acquaintances helped in the snipping of vegetables, cooking and distribution of meals, repairing of infrastructure or working in the kitchen garden. The setup of the “Village of Joy” provides a safety and shelter for some 20 seriously disadvantaged children. Here they live with many animals in a clean environment with plenty of space for play. Our engagement guaranteed the children safety, care, health, balanced food as well as a good education. A master plan for the maintenance and the gradual expansion of the Village was conceived and partially implemented. We analysed the structure of operating costs and elaborated options for their containment. Many RoH members spent their holidays or layover time in the Village, painting walls, laying cables, setting up a computer lab and providing tutoring or yoga classes. In 2011, Rays of Hope acquired a new Toyota minibus for CLM with the assistance of HelpAlliance. Ever since the vehicle reliably transports children to school and to various activities, as well as delivers food for the Village and the school meals – a most valuable assistance for those programs. Thanks HelpAlliance! We would like to express our heartfelt thanks to of all who supported Rays of Hope with donations in the form of bicycles, computers, backpacks, utensils, clothing, medication, books, toys or food parcels. Your continued help is greatly appreciated!